We at TimberTech supply a wide range of high-quality decking accessories, all of which are designed to help you add those all-important finishing touches which turn a good job into a great one. We stock everything you’ll need to refine and polish up your deck, our collection of decking accessories will have your boards looking sleek and flawless in no time. Each pack contains enough clips to fasten 9.3m² of decking and includes stainless steel deck screws. 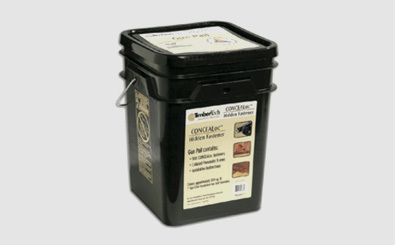 The bulk pack can be used to fasten up to 93m2 of decking. 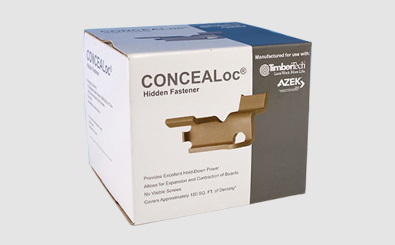 Specifically designed for use with the CONCEALoc® gun, this pack fastens 46m2 of decking. We hire out the CONCEALoc® gun to TimberTech customers. 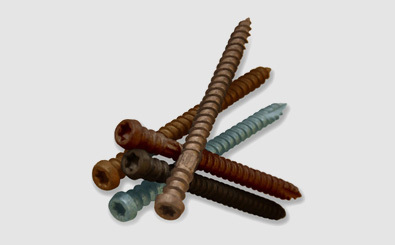 Face fastening screws take the guesswork out of which screw looks best or installs easiest, delivering a colour-matched fastener option that’s ideal for dense boards or situations where hidden fasteners cannot be used. 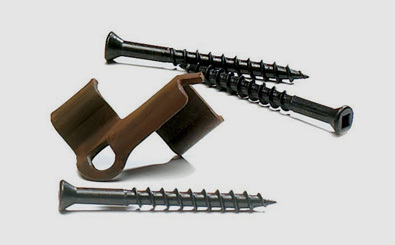 TOPLoc™ screws are specifically designed for our deck boards – they eliminate the ‘mushrooming’ effect that standard decking screws cause when used with composite wood materials. 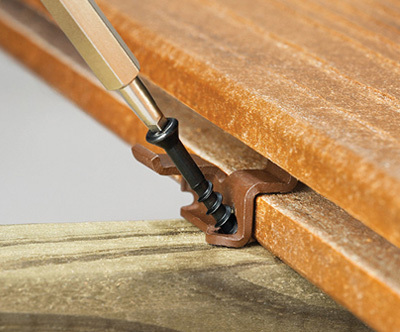 We recommend pre-drilling a 4mm pilot hole to give the neatest finish around the screw head. A screwdriver bit is supplied with each pack of TOPLoc™ screws. Screws are supplied in packs of either 350 or 1750 pcs (you should allow 40 screws per m²) with joists at 400mm centres. Material: zinc phosphate, finished with a thick polymer coating to give excellent protection against corrosion. Screws have a lubricating top coat applied to reduce torque during installation. All TimberTech decking can be crafted and integrated into a seamless final presentation to provide a clean, stylish edge to your finished project. We recommend using deck boards for edging trim rather than our riser boards. 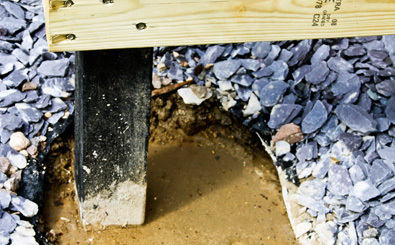 Our rot-free posts are ideal alternatives to timber, giving your whole deck structure years of rot free life. Use 50 x 50mm profile for decks on concrete, paving and flat roof terraces, and the 100 x 100mm section for posts. All profiles are 3.1m long. Cortex™ is a hidden fastening system that’s specifically designed for perimeter boards, stairs, and the first and last boards. 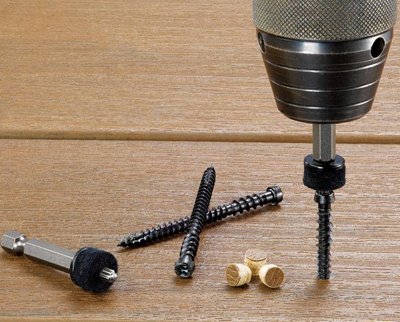 The screws complement TimberTech decking perfectly. 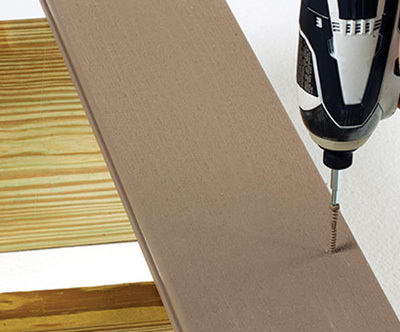 We recommend using Cortex™ screws for stairs/perimeter boards and CONCEALoc® for the body of the deck. 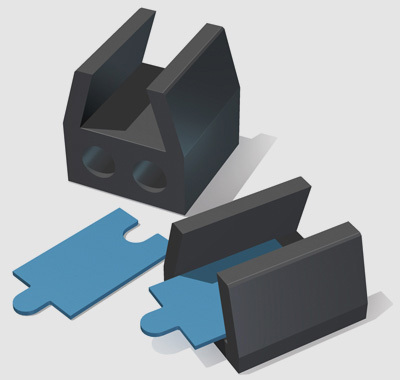 EasyFix black rubber shoes are available in two sizes: 10mm or 38mm. 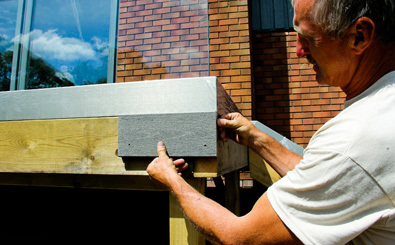 They allow your deck to ‘float’, removing the need for manual fixing and eliminating the risk of piercing your decking’s weatherproof membrane. They also improve drainage and reduce noise pollution. Effective acoustic barrier – useful if there are people living under your balcony or roof terrace! Although TimberTech products are low-maintenance, TimberTech recommends periodic cleaning to help maintain the beauty of the product. Please call 029 2080 3756 to purchase deck cleaner for your TimberTech deck.